Does “one bad apple spoil the whole barrel”? This is a phrase which the popular culture uses often to rationalize its judgments of the individual who doesn’t quite fit. 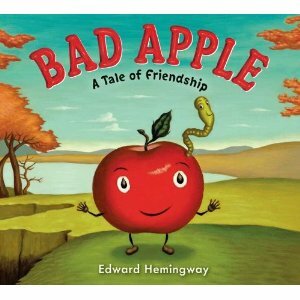 Not according to Edward Hemingway author of Bad Apple- A Tale of Friendship. Edward happens to be the youngest grandson of the renowned Ernest Hemingway. And though as far as we know, Ernest never wrote picture books, Edward has inherited a certain flair for the written word. His tale of Mac, a red Mackintosh, and Will, a worm who befriends him is a story of an odd pairing (sorry about that) that flies in the face of the laws of agronomy. The question is, do worms a bad apple make by association? And if so, is it worth jettisoning a friendship that includes learning how to fly a kite, literally finishing each other’s sentences, playing in the dirt and ending a day in a watering hole to clean off? The taunts of bullies and his sense of self cause Mac to ask a question kids have asked for generations. How do I stand up to bullies? Do I allow them to define me or the friends I choose? Kids may find Mac and Will the “apple” of their eye in this sweet and tasty treat of a friendship with bite. Courage is a theme in some of Ernest Hemingway’s books, so maybe there is something to a writing DNA gene. If so, Edward’s story of Mac is proof that genes and apples with character will out. An apple doesn’t fall far from the tree. Good apples here Edward . Thank you for the positive feedback. It is much appreciated and I’m happy to know that you are enjoying the content of Liz’s Book Snuggery.